Diameters Available: 1 inch, 25mm, custom. *Note: Diameter is held to +/- 0.001 inches from what size is ordered. 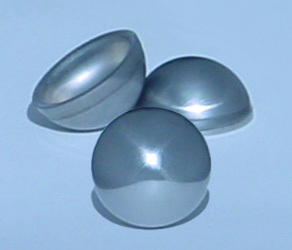 Light Weight – 65% lighter than solid balls, making it far less likely to displace due to patient movement, and easy to attach. Easy Calibration - the highly accurate dimensions of our calibration markers, combined with their precise spherical shapes, permits exact calibrations from any angle. No need for special positioning. 100% USA manufactured from 440A stainless steel; which is the same material used in many dental and surgical instruments. High surface hardness - discouraging any distortion of the dimensions when stored or dropped. Identification - these balls can be laser marked with their exact size, your company’s logo, serial numbers, and/or any information you might need.